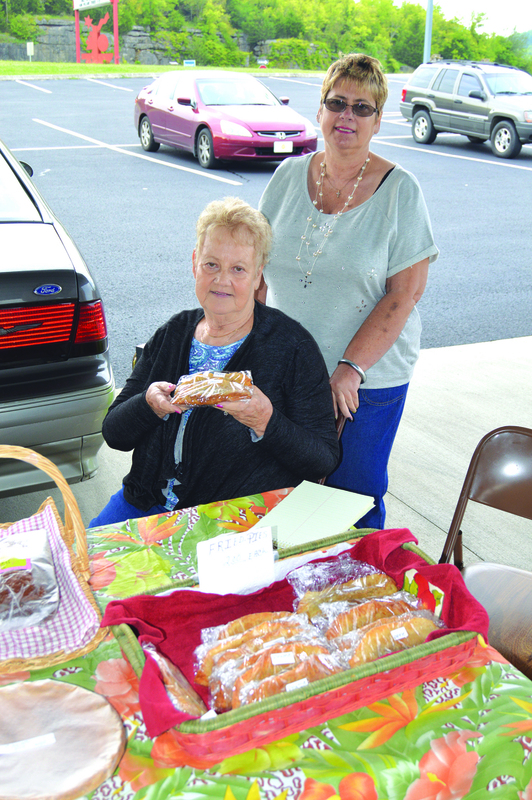 Irene Vickers Hollis (with daughter Teresa Scott) is known as the "Pie Lady" at Woodbury's Farmers Market. Tick tock ... it's 6 a.m. and Woodbury resident Lou Goins is on the move. Being early, she motors slowly toward the Saturday morning Farmer's Market at the Arts Center of Cannon County on the John Bragg Highway for fresh locally-grown vegetables. But, that's not the main target of her destination. Enter "Fried Pie Lady" Irene Vickers Hollis, from the Hollis Creek community. "Lou is one of my most loyal customers, coming each Saturday morning to restock her supply of my fried peach pies," confirmed "Fried Pie Lady" Irene, as her time-worn hands move in a blur while constantly restocking her little store of homemade fried pies at the busy Farmer's Market. "I come each Saturday," confirmed Ms. Goins, who claims the pies are not for her personal consumption. "They're for my 89-year-old mother Nora Cook. She loves Irene's fried fruit pies. Since I'm on a diet, I'm telling the truth, these pies are definitely for my mother." Well-known Cannon County resident James L. Adkins was one of the earliest Farmer's Market consumers. "Irene and her fried pies are legend in our beautiful rolling Cumberland Mountain foothills," Adkins added. It appeared Farmer's Market veteran vendor John Howell couldn't stay put at his own vegetable produce stand: "My husband always ends up over there, getting pies from Irene," accounted wife, Cheryl. "He can't get enough of neighbor Irene's fried fruit pies. Sometimes, he prefers the peach, or the apple and today, there's a special raspberry selection." The Fried Pie Lady says prayer is a main ingredient of her pies. "At age 77, I pray for the strength each week, to do my pies, because they seem to bless so many people," Irene testified. "I also pray in thanks for the neighborliness that remains alive and well in our beloved Cannon County." Irene was asked for an example of being a good neighbor: "See Cheryl Howell over there in her vending booth ... she's 'breaking' green beans with her own hands at no extra charge, for one of her customers who has arthritis so bad in her hands, the lady can't prepare her own beans for cooking." Irene comes from a family of "good neighbors," including her brother, the late C.L. Vickers, a legendary garden-growing man also famous for his yearly "weather prognosticating" forecasts by the signs of Mother Nature. "I miss my sweet brother, and I miss my husband, both of whom died more than a decade ago," Irene stared back through the mist of time between customers. "Our parents, (the late) Charlie and Vera Vickers, taught us to be good neighbors. You know, money can't buy a good neighbor. "Being a good neighbor, is like the Good Book (Bible) says, treat others as you would treat yourself," Irene testified. "I'm thankful for so many good neighbors we have here in Cannon County." She was married to David "Bee Man" Hollis, who was known for his home-grown honey along the banks of Hollis Creek located "over yonder" in the Readyville community. "I've still got my husband's old bee houses," Irene accounted. "You gotta sample my molasses cookies, which are also very popular," Irene instructed. "That molasses came straight from Mr. Bill Smith's personal stockpile of molasses, one of the best neighbors that Cannon County has ever produced." Irene is also "famous" for homemade jam cakes around Thanksgiving and Christmas. "I'll share two important ingredients in my jam cakes that I'm already getting orders for," Irene shared. "Prayer, and I use fresh-hulled black walnuts in my jam cakes." She has three daughters who share her Cannon County creative culinary capabilities: "My middle daughter ('Terrific' Teresa Scott) helps me out here at Farmer's Market every Saturday. She fixes a mighty good fried fruit pie herself." "One year, I competed against Momma's fried pies at a contest here in Woodbury," Teresa noted. "I tried hard, but I came in second behind Momma, who won the blue ribbon. That was the year Pam Northcutt came in third." "All my three girls, Anita Davenport, the oldest, and Deena Wheeler, my youngest, are good cooks," Irene confirmed. "Deena (a postal worker in the Lascassas community of Rutherford County) has asked that I help teach her the finer points of making a tasty fried pie." That way, Irene Vickers Hollis' family tradition of tasty fried fruit pies will live on ... and you owe it to yourself to not miss sampling Irene's cookies made of pure Cannon County-produced molasses.